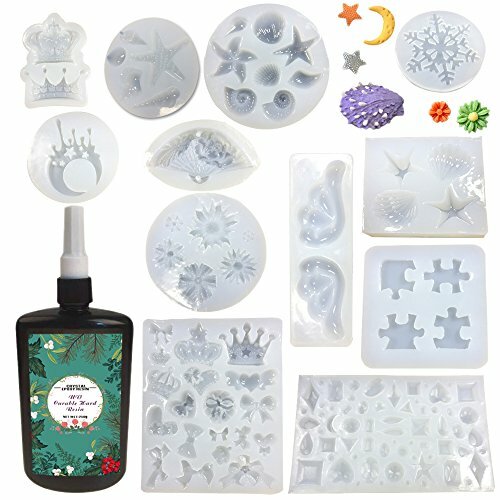 12Pcs Transparant Silicone Mould:Angel wings, Gem, Ocean series, Small round daisy, Jigsaw, Crown, Snowflake, Moon and stars etc. 2.Non-toxic and environmental protection, Superb transparency and hardness. 3.Perfect for making Resin Jewelry, Necklaces, Earrings and other nail art accessories. 4.Fast solidify, within 5-30 mins depends on the light you use. It can save you a lot of time and enable you to stop wasting time on waiting. Step 1: Before using this product, please remember to place this product upside down to prevent air bubbles from escaping. Step 2: Use a toothpick to concentrate the air bubbles on the dispensing surface. Step 3: Blow it with a heated air gun or bake it with a lighter or remove it with a straw.